Chicago advertising agency Stevens & Tate Marketing has begun brand development for Zorn Brew Works with the launch of the company’s brewery website. I needed a partner who could provide guidance and expertise across all facets of marketing. The team at Stevens & Tate know how to build a following for Zorn Brew Works and take the brewpub, beer and future developments to market. Stevens & Tate Marketing has launched the brewery website for Zorn Brew Works, a new microbrewery in Michigan City, Indiana. 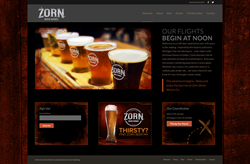 The brewery website, ZornBrewWorks.com, is the first step in establishing the brand for Zorn, which has a rich heritage in the city’s Elston Grove area. The history of Zorn Brewing dates back to the late 1800s when Philip Zorn Jr. established a microbrewery at 9th and York streets in Michigan City. Today, Zorn Holdings LLC is renovating the manufacturing facility to produce and distribute craft beers locally. A taproom and restaurant are under construction, as well, and are scheduled to open this summer. For the Zorn Brew Works brewery website, the agency focused on story telling to create an emotional and experiential connection with readers. It also used life moments to visually engage viewers with the brand. While Stevens & Tate used the brewery website as the vehicle for Zorn Brew Works’ brand development, imagery and messaging will carry over into additional marketing efforts to promote the brewpub’s opening. Once the microbrewery is up and running, Van Prooyen plans to bring live entertainment to the property. He also has 2-1/2 city blocks surrounding Zorn Brew Works available for future development. Working on the brand development for Zorn Brew Works was a natural fit for Stevens & Tate, which has a hospitality background serving travel and tourism clients in the Midwest and nationwide. The agency has worked with The Abbey Resort; Grand Geneva Resort and Spa; Grand Traverse Resort; Le Meridien; Marcus Hotels and Resorts; Mission Point Resort; Sofitel; St. Barth Exclusives; and Timber Ridge Lodge and Water Park among others. In addition to creating focused, targeted solutions for clients in the hospitality and travel/tourism industries, Stevens & Tate has experience in the food/grocery, real estate, senior living, retail, healthcare, business-to-business, and non-profit sectors, as well. A full-service Chicago advertising and marketing agency, Stevens & Tate offers award-winning, on-strategy creative; integrated message and brand development; Internet and digital advertising; and cost-effective media planning and execution. To learn more and view the firm’s work, visit http://www.stevens-tate.com or call (630) 627-5200.